After an ill-fated pizza spot appeared and disappeared next to the Eagle on North Lombard, if you’d have asked me what could survive in that largely residential no-man’s-land between I-5 and MLK Boulevard, I would not have said, “$24 ceviche and $14 pisco sours.” If a recent Saturday night at Casa Zoraya is any indicator, I’d have been wrong. The story leading up to the restaurant’s opening was heartening—Casa Zoraya is named for Zoraya Zambrano, who comes with a Portland Peruvian cuisine pedigree after years at Andina—and heartwarming, as well. Zambrano is the matriarch of the new restaurant, and the family operation also includes her children, Gloria and Gary Marmanillo. As I wrote a couple of weeks ago, I wasn’t bummed when Bloodbuzz opened. But in the political and cultural climate of 2018, on a street now home to a coffee/booze cart named for a white hipster dad-rock band (that I love, to be honest) it’s a different sort of fun to see excitement for a new business owned by immigrants and women, in a building home to a queer Portland mainstay like the Eagle. When the menu went up in the window of Casa Zoraya, I did a double take. I don’t know where else in a two-mile radius someone’s averaging $20 a plate. But there was also a sandwich board outside advertising chicha morada pisco sours. I’m not an idiot, so I went in. The food and the drink put even the brilliant colors of the décor to shame: nutty, rich, coolly spiced aji sauces had me wondering if “amarillo” was somehow more yellow than “yellow,” and if “verde” actually meant “the greenest green you’ve ever seen.” The pisco sour was a deep, swirling purple, made with a house chicha morada—a softly spiced, pineappley, purple corn drink that pairs perfectly with the citrus zing and egg white fluff of the classic Peruvian cocktail ($14). Convinced by the small plate and cocktail, I resolved to give the pricier fare a shot with a few friends. We didn’t quite listen when the server said everything was for sharing (one of my party actually said, “I don’t share well”—that’s how American we were that night), and we each ordered a large plate. We threw in the chicharron, too—no light, crisp cracklins, but hunks of skin, meat, and fat that were hefty enough to play some lazy summer lawn sport with ($14). Many of the dishes revolve around a featured catch-of-the-day fish or seafood, which on this particular night were salmon and blue marlin. It’s a small miracle of food sourcing and kitchen skill that both fish stood up to the leche de tigre (tiger’s milk) ceviche marinade of citrus and chili that coated them in a pretty, neon-pastel sheen—lesser fish would have drowned and less subtle sauce would have burned (this leche de tigre is no-joke spicy, though). In the mixed ceviche carretillero ($24), the octopus was worth digging out and fighting over, and the portion of calamari-style fried squid lasted the whole night as finger food. Yet as great as the ceviches are, the pastel de choclo y mariscos may be the plate to beat, especially if you’re squeamish about citrus-cured fish. In a blown-up version of a traditional corn-crusted casserole, an array of fish and seafood sits on a soft, palate-expanding, quinoa-corn-cake—and the scallops—both sea and bay—caused another mild competition at the table ($24). The menu also features lamb and various preparations of chicken, but for non-sea creatures, the lomo saltado is hard to beat. Hunks of tender beef in a tamari-tomato stew with onions and even more potatoes, served with fluffy, garlicky rice—at a surf-heavy restaurant, it’s the turfiest of the turf options, heavy earthen minerality lit up by bitey, oniony brightness ($20). Having eaten enough food for a party twice our size, we eyed the dessert menu cautiously. We were smart enough to ask about portion size this time: the alfajores shortbread was small (we’d need two orders), but the picarones (sweet potato donuts) came four-to-an-order. We did both, duh. The alfajores was indeed small, despite a heap of two kinds of dulce de leche, but the picarones are four full-sized donuts, served with a rich, figgy caramel sauce that is out-of-this-world delicious ($7). Skip a cup of stale coffee (seriously, Portland, can nobody make a fresh cup of coffee for dessert? 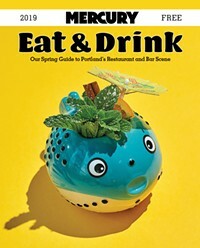 ), and try a boozy dessert sipper like a local vermouth or a rare, toothy white port. I’d usually have to tell you to go out of your way to visit a corner not otherwise known for destination dinners, but in this case, maybe you should even make a reservation. Casa Zoraya is raising the bar for the whole neighborhood, and I don’t know if it’s the family-business PR narrative or the din of Spanish and English conversation in the restaurant, but I’m not even mad about the price point—it’s a welcome, natural addition to the neighborhood.